Another Saturday and another painful 90 minutes from our boys in blue. Rather than build on a good win at Crystal Palace and what looked a positive bout of warm weather training for Everton, an average Watford claimed the three points in what was a less-than-memorable Premier League encounter. But if the Hornets were average, then it was a damn sight better than what we turned out at Vicarage Road! I don’t pick the team, train the players, or oversee the day-to-day running of my great club, but it was hard to be anything other than negative about what has been yet another instalment of a painfully disappointing and underwhelming season. But then I found one obvious tick in the positive column; the hordes of Blues who yet again sold out the away end and represented the club so well. And it is the fans who can, and do, play a pivotal role in the career of one player so desperate to succeed for his boyhood team. Tom Davies, who notched his 50th Premier League appearance for Everton on Saturday, has had a largely underwhelming season, much like the rest of his colleagues. Some fans remain sceptical about his ability and whether he will truly stand out at this level, while some truly believe the Liverpool-born youngster can equal or even eclipse the many great midfielders he has drew comparisons to. Be our very own Stevie G if you please! But the cold hard fact is that the nephew of Goodison great Alan Whittle is not Gerrard, or even the new Ross Barkley. He is Tom Davies and that is no bad thing. Football fans do it the world over. A promising young talent explodes onto the scene and he is instantly compared to greats gone by, I have been one of the worst for doing so during my years of watching the beautiful game. You watch the player’s style, skill, temperament and then trot out the following; ‘He’s the new…’ or ‘’he reminds so much of a young….’. Davies burst onto the scene with a man-of-the-match display against Norwich on the final day of the 2015/16 season. It seemed so poetic that a product of our wonderful youth was given his first start by fellow graduates Joe Royle and David Unsworth, our management duo for the day, and the stage was set for yet another prospect to spread his wings. And spread them he did the following season! Without doubt the crowning glory for our ‘Ketwig Kaiser’ was THAT Manchester City goal. Collecting the ball in his own area, producing a solo run that brought many grown men to tears, culminating in that deft finish which belied his tender years, was a moment many hope will be an ‘I was there moment’. But this season has not quite lived up the hype of the previous for the 19-year-old. Not his fault, more a collective team failure, but Davies himself will be critical of his performances and be hell-bent on his improvement. My previous piece pointed to one player having a lack of heart and desire to win the adulation of the Goodison faithful, the same cannot be said of Everton’s current Young Player of the Year. He has bad games, sometimes makes incorrect decisions and won’t be able to produce the kind of display he did against Manchester City in January 2017 every week. But the good news is he wants to and his 100% commitment and determination should not be overlooked and I don’t believe Goodison will. This season has been a campaign to forget but we won’t forget Tom Davies, a beacon of hope that shows our future is still bright. 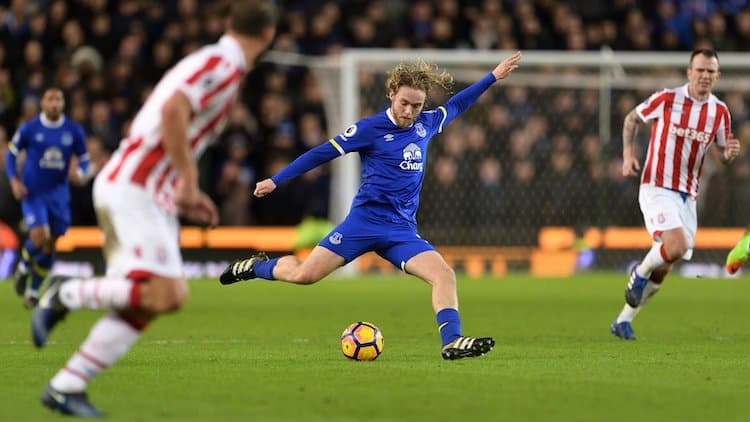 Fans of every club are desperate for their youth-team coaches to produce the new Gascoigne, Scholes, Lampard and so on, but me, I’m happy that we have produced Tom Davies and look forward to him repaying the faith of a group of supporters who know a player when they see one!